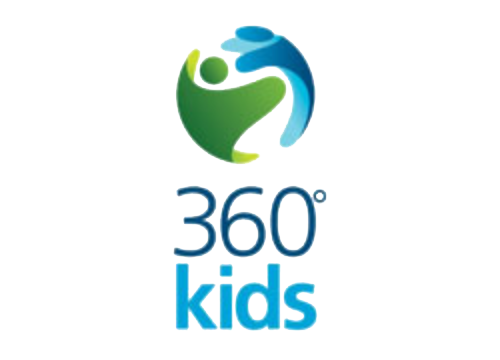 360º kids is a not-for-profit agency based in York Region, Ontario that provides programming, short-term and interim shelter to at-risk youth. Profiled the issues that contribute to youth homelessness. Integrated media into the event from participation on the overnight 360º Experience, to securing morning-of live radio coverage and on-site weather reports. Leveraged the involvement of participants such as the police chief, retired fire chief, the organization’s board members and government representatives. Wrote Huffington Post series of articles with first-hand stories from event participants, field experts and youth who have lived on the streets. Each year, the organization met its fundraising and awareness goals. The coverage lead late-night newscasts, and segments were repeated multiple times on the two most-watched morning shows. Coverage appeared, often multiple times, on CBC, CTV, CityNews, CP24, Breakfast Television, Global News, Hufﬁngton Post, 680 News, TSN, Metro Morning and Richmond Hill Liberal. 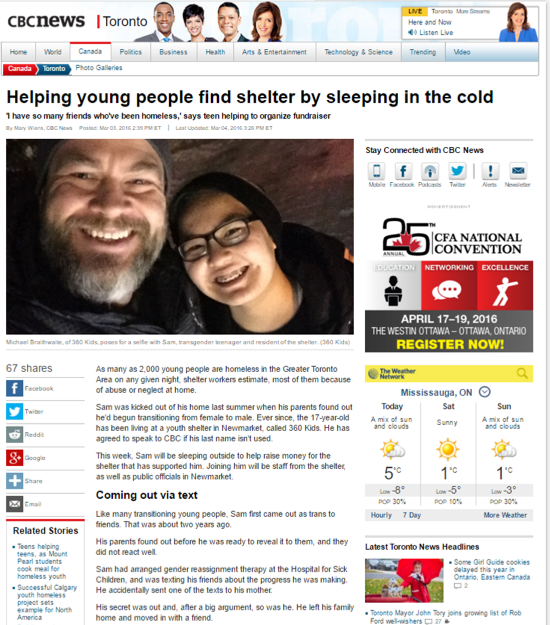 More than 60 pieces of coverage of the organization and issues related to youth homelessness was secured on local, regional and national online media outlets, with impressions exceeding 25 million. The quality and breadth of pieces made the coverage stand out. Each piece played a critical role in helping shine a light on important issues that do not normally receive attention. 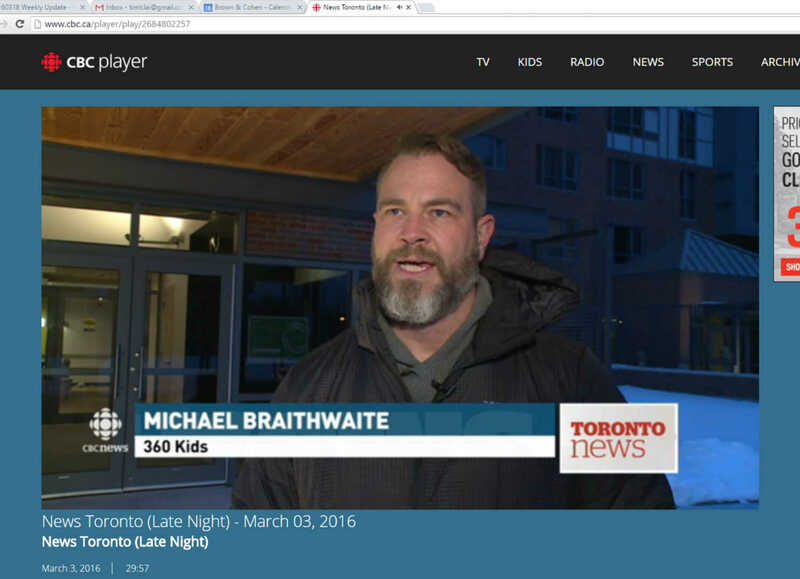 CBC NEWS TORONTO: REPORTER NICK BOISVERT COVERED THE LAUNCH OF THE 360º EXPERIENCE, HIGHLIGHTING THE SCENARIOS PRESENTED TO COMMUNITY LEADERS AND INTERVIEWED EXECUTIVE DIRECTOR MICHAEL BRAITHWAITE AND 360º KIDS SUCCESS STORY, AMANDA. THIS WAS THE SECOND STORY OF THE NEWSCAST. CTV NEWS AT 11:30: REPORTER COLIN D'MELLO COVERED THE LAUNCH OF THE 360⁰ EXPERIENCE IN DETAIL AND INTERVIEWED EXECUTIVE MICHAEL BRAITHWAITE, 360⁰ KIDS BOARD MEMBER CHRISTINE WALTERHOUSE, RICHMOND HILL MP MAJID JOWHARI AND HIS DAUGHTER NICKTA. THE STORY RAN SECOND IN THE NEWSCAST. 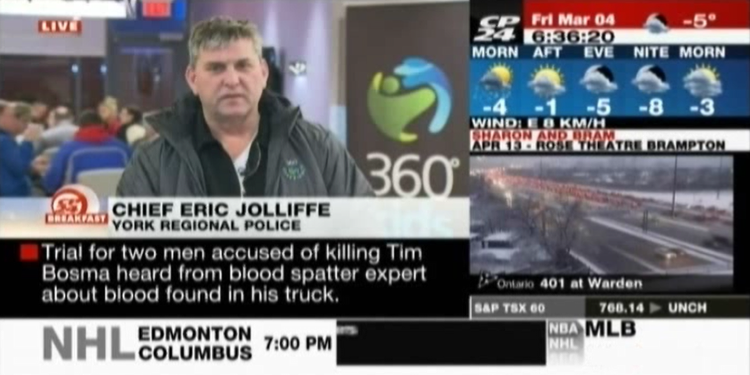 BREAKFAST TELEVISION TORONTO: THIS POPULAR SHOW RAN LIVE IMAGES FROM THE CONCLUSION OF THE 360⁰ EXPERIENCE. DURING A LIVE INTERVIEW WITH EXECUTIVE DIRECTOR MICHAEL BRAITHWAITE, A CALL TO ACTION TO DONATE WAS ISSUED ON THE SHOW. THE EVENT WAS MENTIONED MULTIPLE TIMES AGAIN DURING THE REST OF THE MORNING SHOW. 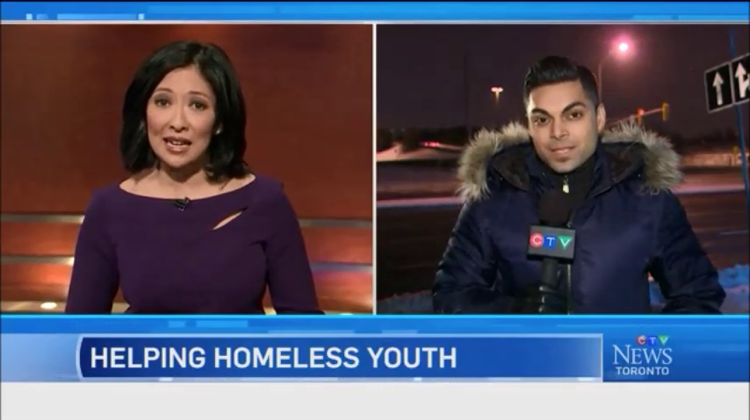 CITYNEWS AT 6: REPORTER STELLA ACQUISTO, WHO PARTICIPATED IN THE 360⁰ EXPERIENCE IN 2015, RETURNED TO PROFILE TWO YOUTH WHO WERE HOMELESS AND ARE NOW 360⁰ KIDS SUCCESS STORIES. SHE FOLLOWED THEM AS THEY PARTICIPATED IN THE EVENT TO GIVE BACK TO THE ORGANIZATION THAT SUPPORTED THEM NOT SO LONG AGO. 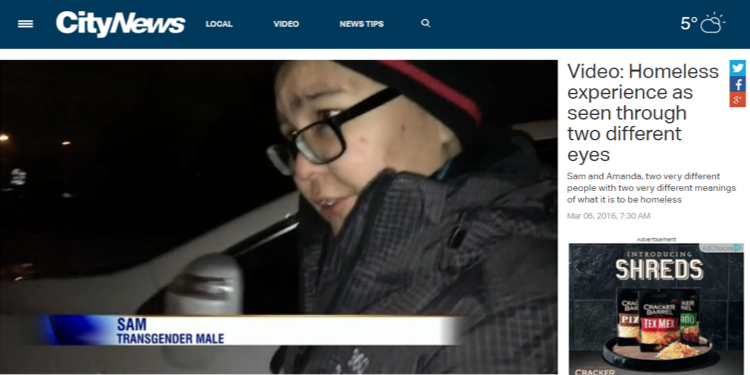 CBC NEWS: METRO MORNING HOST MATT GALLOWAY INTERVIEWED EXECUTIVE DIRECTOR MICHAEL BRAITHWAITE AND FORMER HOMELESS YOUTH SAM, A TRANSGENDER TEEN, ABOUT BEING KICKED OUT OF HIS HOUSE AFTER REVEALING TO HIS FAMILY HE WAS TRANSITIONING FROM A FEMALE TO MALE. THE INTERVIEW ALSO COVERED MANY OTHER ISSUES THAT CAUSE YOUTH HOMELESSNESS AND PROMOTED THE UPCOMING 360⁰ EXPERIENCE.